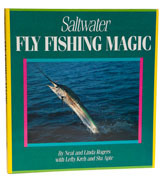 This is undoubtedly one of the best picture books published to date on saltwater fly fishing. What you get is a large format extravaganza of eye-popping photography of every variety, from long, sneaky casts to underwater shots - you name it, it is covered here. The overall effect is quite stunning, the mood is great, the quality is very fine and it makes me want to go fishing. If you like this, check out Flip Pallot's Memories, Mangroves and Magic, photographed by the same team.